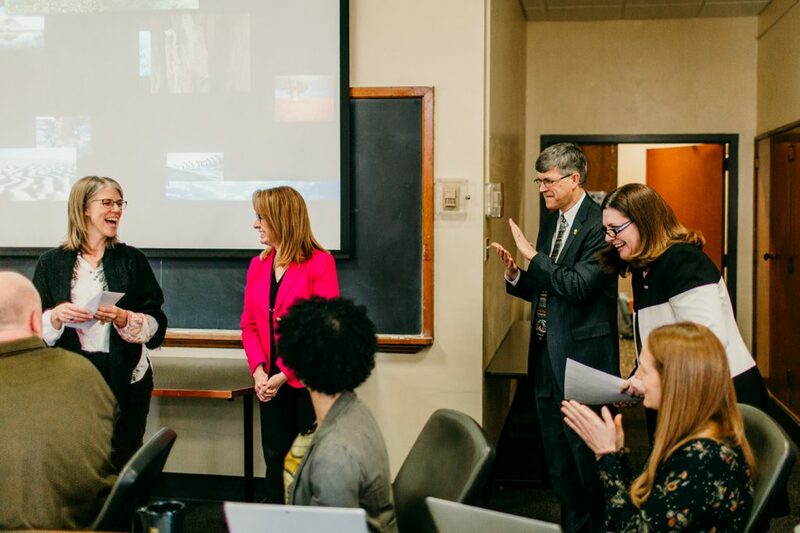 Lisa Dorner, an associate professor in the Department of Educational Leadership and Policy Analysis, was presented the UM System President’s Award for Intercampus Collaboration. The award recognized Dorner’s work with Kim Song, an associate professor of education at the University of Missouri-St. Louis. The award, which includes a $2,000 prize for each recipient, recognizes faculty who engage in activities that foster collaboration across two or more campuses of the UM System. University of Missouri System Chief Human Resources Officer Marsha Fischer, University of Missouri College of Education Dean Kathryn Chval and Vice Provost Jim Spain presented the award. 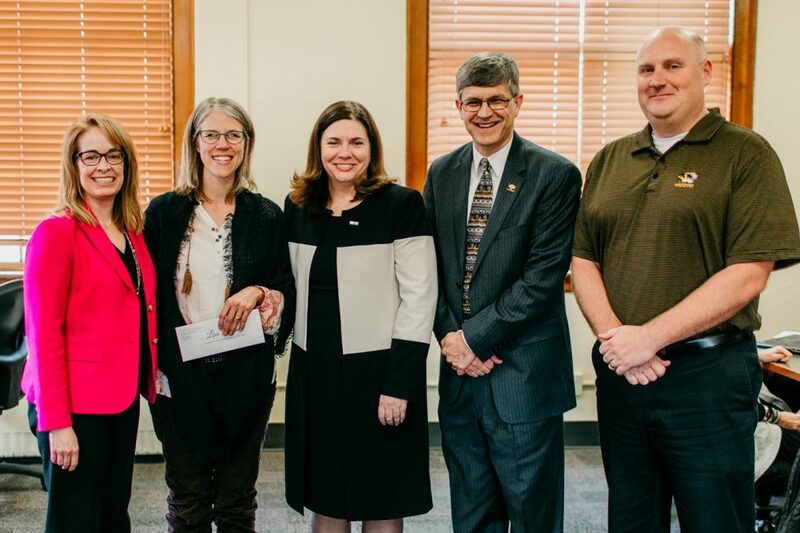 UM System Chief Human Resources Officer Marsha Fischer, Lisa Dorner, Dean Kathryn Chval, Provost Jim Spain, and Brad Curs, ELPA Department Chair, were on hand to present the award. In 2013, Dorner and Song established a collaborative working relationship, which has resulted in a number of impressive cross-campus initiatives in the areas of teaching, research and outreach. Outcomes of their partnership have included federal grants, teacher professional development programs, University of Missouri Online Course Sharing projects and the creation of the Missouri Dual Language Network. The network of more than 230 educators, parents and university professors supports multilingual education. Lisa Dorner was surprised with the UM System President’s Award for Intercampus Collaboration. Prior to their collaboration, neither MU nor UMSL offered interdisciplinary courses on immigration, language and global education. Upon receiving a UM System course sharing grant, the team coordinated nine faculty from seven departments in the Colleges of Arts and Science and Education at MU, UMKC and UMSL. They have developed and offered four courses on “Language and Global Education” to more than 50 students. Their collaborative intercampus approach exemplifies perfectly the criteria for the President’s Award for Intercampus Collaboration, said Ann Taylor, dean of the College of Education at UMSL. The UM System President’s Awards are presented annually to faculty members across the four campuses of the UM System who have made exceptional contributions in advancing the mission of the University. Dorner and Song will be formally recognized by President Choi during an awards celebration to be held in June.